Here's something quick, yet tasty and good for you in the morning if you don't have time to prepare a hearty breakfast. Directions are quite simple. Toast bread and spread cream cheese on it. 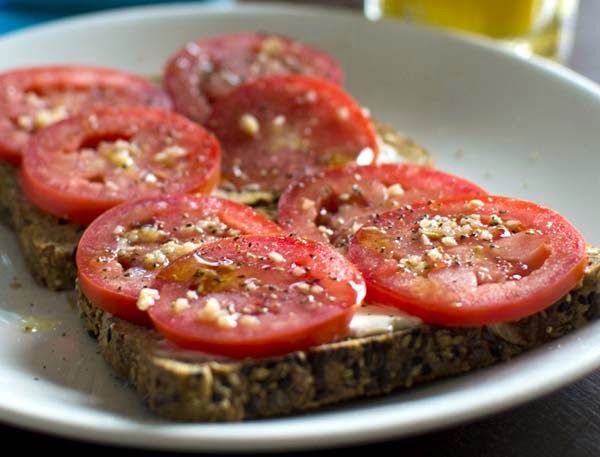 Slice tomatoes and rub with minced garlic. Drizzle olive oil. Salt and pepper to taste. Eat up and go on about your day. Great thing about this breakfast is the tomatoes. I love them. They have an oodle amount of vitamins and antioxidants. But more importantly, tomatoes are good for your skin, specially if you're out and about in the sun. Which is most of my summer. Another healthy breakfast idea is a quinoa frittata. Check it out.